The exhibition "Unexpected Dali" is composed by exhibits from private collection of original works made by Salvador Dali : lithographs, ceramics, works in bronze, silver, gold. The exhibition "Unexpected Dali" highlights the major key aspects of work of the greatest artist of our time - Salvador Dali. 126 original works of Salvador Dali. Rarely exhibited original works of Salvador Dali from total quantity of 114 exhibits : 63 original works to be hung on the wall and 63 original works for exhibit in display cases. Lithographs, serigraphs on silver, tapestry, paintings on porcelain, postal cards, silver medals, sculptures, advertising poster, original pendants, medals, sculptures, bas-reliefs, ceramic tiles,... . The exhibition "Jean Cocteau. Line-Drawings" is composed by 137 Jean Cocteau's original works from Collection Kesauri. At the exhibition are presented two portfolios of Jean Cocteau : "Dessins" and "La dame aux chats". Portfolio "Dessins" contains 126 linocuts of Cocteau’s early drawings. This is absolutely unique pencil autographed personal exemplar of Jean Cocteau and in fact his unique working tool for first edition of portfolio published at Paris on 1923 in 625 exemplars. Many drawings contain pencil hand writed by Cocteau himself remarks or titles. On the dedicational page to Pablo Picasso, Cocteau has corrected by pencil the fault in text - in the word "frits" the letter "r" is to be replaced by letter "a", giving the just word "faits". Lithograph from suite “La dame aux chats” are signed on colophon by Jean Cocteau and Louis Émié. This portfolio is from limited edition number XXIII/XXV, made on Paper "Pur Chiffon à la main" and edited by "Les Editions de Pujols" in France on 1962. 137 original works of Jean Cocteau. - 131 Original Linecuts, portfolio «Dessins» - 40 x 50 cm. - 6 Original Lithographs, portfolio "La Dame aux Chats" - 40 x 50 cm. Rarely exhibited original works of Jean Cocteau from total quantity of 131 exhibits - all to be hung on the wall. The exhibition is composed by suites of 45 original litographies of Marc Chagall. All Chagall’s works are a rebellion against the rules. The world of his paintings is full of with contrasts and contradictions, contains in such a pure form the absurdity, which is available only with genius artists; he shows in his works authentic, accessible to the artist, but hidden from everyone else the face of the world. Memory of the Jewish people and his own impressions were the basis of Chagall’s creativity. They joined with extraordinary imagination inherent to artist, and with the directness of looking at the world, which allowed Chagall to reveal the truth in the most simple and ordinary events, although resettled with his will from earth to heaven. 57 original works of Marc Chagall. 16 Original Lithographs, Cycle of «Daphnis & Chloé» - 43 x 53 cm. 13 Original Lithographs, Cycle of "Four Stories of the Thousand and One Nights" - 43 x 53 cm. 16 Original Lithographs, Works out of cycle - 43 x 53 cm. 12 Original Lithographs, Cycle of "12 Tribes of Israel" - 33 x 43 cm. Additionally we provide inside decorative banner for the exhibition area. The exhibition "Materialization of the Surreal" is composed by exhibits from private collection of original works made by Salvador Dali : lithographs, ceramics, works in bronze, silver, gold. The exhibition "Materialization of surreal" highlights the major key aspects of work of the greatest artist of our time - Salvador Dali. 115 original works of Salvador Dali. 20 Original Lithographs, Series «La Tricorne» - 43 x 53 cm. 16 Original Lithographs, Series "Benvenuto Cellini" - 33 x 43 cm. 13 exhibits - 60 x 80 cm : Series "Twelve Apostles or Knights of the Round Table"
50 original works for exhibit in display cases. This exhibition present 80 original Holbein's woodcuts published in 1547 - Icones or Series of the Old Testament. This work of Holbein represents a pivotal moment in the history of Bible illustration. It contains two works: The images of the stories of the Old Testament and Portraits and figures from the story of the Old Testament. One edition was printed in 1538 in Lyon with printing errors. Corrected edition was printed in 1547. Precisely this corrected edition of 1547 is estimated as classical and original edition of this series Holbein's works and is presented on our exhibition. Each page is dominated by the woodcut, headed and footed by the Latin and French text. Series is designed by Hans Holbein, c. 1526, and carved by Hans Lützelburger, German blockcutter. He is known for his virtuoso work on series of tiny woodcuts designed by Hans Holbein the Younger which whom he collaborated until his death. Holbein transformed the traditional late medieval iconography of the Old Testament. He conveyed emotional depth through nuance of facial expression and body language, by his solidly contrappostal figures within clearly defined spatial settings, by beautifully structured compositions, and by enrichment of the images with ancient as well as contemporary costumes. 80 original works of Hans Holbein the Younger. Rarely exhibited original works of Hans Holbein the Younger. Total of 80 original woodcuts published in 1547, are placed two by two on each side of exhibits. Exhibits are encrusted in window of each hessian (burlap), on 21 panels in total. Size of one panel is approximatively 105 cm width x 250 cm height. Total quantity of exhibits : 80 original woodcuts (published 1547). Those that will be hang : 21 double side woodcuts. Original double side woodcuts published 1547. Exhibition is composed by panels, on which are hang exhibits. 2) Each hessian (burlap) has window where is suspended exhibit in plexiglass (also accessible from both sides) and LED lights for each exhibit and etiquette. The exhibition "Hidden faces" is composed by exhibits from private collection of original works made by Salvador Dali : Serigraphs on silk, tapestries, lithographs, ceramics, works in bronze, silver, applied arts... The exhibition "Hidden faces" highlights the major key aspects of work of the greatest artist of our time - Salvador Dali and reveals unknown limits of his work. The aim of the exhibition is to help the public to see and understand how Dali materializes his views thanks to his special artistic language in the form of images, which often take an intangible aspect, but clearly are felt by spectator. 108 original works of Salvador Dali. 61 original works for exhibit in display cases. The exhibition is showing how Toulouse-Lautrec illustrates the Belle Époque : splendid works on two series - one on thematic is illustrations for "Au pied du Sinai" of Georges Clemenceau, where are presented Polish Jews, other representing illustrations for the popular ballads of Desire Dihau... This he did in an insightful way, capturing the essence of characters and places. Toulouse-Lautrec’s subject matter was to become thoroughly modern and he became an influential figure in the evolution of the art of the twentieth century. Also this work on "Au pied du Sinaï" can be viewed as Lautrec’s only foray into the political arena of his time. 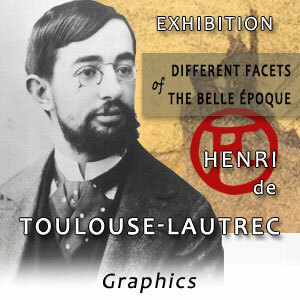 45 original works of Henri de Toulouse-Lautrec and additionally 7 memorabilia and post cards relative to Yvette Guilbert. The exhibition gives to public the opportunity to admire close to 45 rarely exhibited unique original lithography carefully chosen for their quality of realization by great master himself and 7 exhibits related to the personality of Yvette Guilbert. All lithographic stones was engraved by Toulouse-Lautrec himself. Additionally we provide 3 inside decorative banners for the exhibition area. In 1950, at the request of Libreria dello Stato in Rome, Salvador Dali undertakes to paint 100 watercolors illustrating 100 songs from the Divine Comedy of Dante. The work continued from 1950 to 1963. After first stape, when dali realized illustations for this series, the selection of colors, engraving of 3500 woodplates, which were necessary for the creation of 100 xylographs, took four years, or 55 months of continuous work by a group of best specialists in presence and continuous assessment of the Master (April 1959 - November 1963). This work is considered as one of the most significant of the 20 century. At the exhibition can be also presented a unique material which helps the viewer to understand the scale of the accomplished work and to penetrate into the process of creating the represented masterpiece - the color decompositions of 10 plates - about 600 xylographs. Also can be presented 100 unique black and white copper plate etchings - this is also an unique material realized in comppletely different technique than xylography. The exhibition gives to public the opportunity to admire complete set of all 200 works realized in portfolio "Divine Comedy" of Salvador Dali. All xylographs was owned by movie star Marine Vlady. Art critics divide Giorgio De Chirico's work into 3 periods: the metaphysical, classic and neo-metaphysical. Proponents of his metaphysical period deny the importance and value of classic works. In the concept of our exhibition we proceed from the fact that De Chirico himself does not did such a distinction and for him all these visual styles were organic and equally have expressed his artistic ideas. In the Classical Art, he saw the possibility of realization of ideas, equivalent to those which give a metaphysical image. And in every work carried out by him in the style of «Classical Art» clearly felt that the reality and realism are transformed into ominously silent and vacant settings for invisible dramas. 26 original lithographs - Portfolio "Iliade"
24 original lithographs - Portfolio "Hebdomeros"
Original color Lithograph "The troubadour with the Moon"
Original color Lithograph "Agomonte Drappo Verde"
The exhibition gives to public the opportunity to admire 53 rarely exhibited unique original lithography of Giorgio de Chirico carefully chosen for their quality of realization. The aim of the exhibition is to help the public to see and understand how Dali materializes his views thanks to his special artistic language in the form of images, which often take an intangible aspect, but clearly are felt by spectator. The exhibited works demonstrate Dali’s creative side, which are unknown to a wide audience, but nonetheless which are essential for the understanding of his art, fantastic world and artistic techniques used by Dali to implement it in a variety of forms and genres. On this point particularly interesting are his designs. Personal items are also interesting, especially Necktie pins, undoubtedly made from Dalí’s layouts. 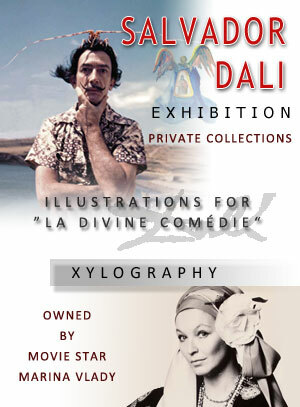 Total of 186 Original works of Salvador Dali. The exhibition gives to public the opportunity to admire 186 rarely exhibited unique original works of Salvador Dali: 50 original works to be hung on the wall and 136 original works for exhibit in display cases. Total of 58 Original works of Léonor Fini. Exhibition “Biblical themes” consists of Salvador Dalí's, Marc Chagall's and Giorgio de Chiricos' original works, which evokes shocking and surreal dreamlike images of twentieth century. Exhibition presents original artworks, created by aforementioned three big artists, continue in various forms to influence the progress of the process of modern human spiritual life in our time. Problems and themes of Christian religious sources seen with their eyes are common to all mankind and are very interesting in terms of cognition of their unique vision of religious problems and understanding themselves as modern continuators of great spiritual traditions of world art. Total of 96 original works of Salvador Dalí, Marc Chagall and Giorgio de Chirico. - 12 Original works of Marc Chagall - series "Twelve Tribes of Israel"
- 22 Original works of Giorgio De Chirico - series "Apocalypse of Saint John"
Degas created the series of monotypes made 1877–78 to illustrate Degas' close friend, writer and librettist of Ludovic Halévy’s book, La Famille Cardinal, a satire of social-climbing ballet dancers. Total of 34 original works of Edgar Degas with additionally presented a unique material which helps the viewer to understand the scale of the accomplished work and to penetrate into the process of creating the represented masterpiece - 11 decompositions. - 34 original heliogravures : complete portfolio for "La Famille Cardinal" - 43cm x 53cm. - additionally 2 prints - 40cm x 50cm. Two prints to demonstrate the difference between works of Degas and works of his contemporary painters, and one big banner on black tissue with portrait of Edgar Degas. Presented rarely exhibited material is realized in a variety of styles, corresponding to the artistic vision of painters that are belonging to different generations and are working in various artistic styles. All the works are united by one thing - by fearless and relentless spirit of the one who inspired the artists for their creations - Ernest Hemingway, which continues to inspire generations of people around the world. Total of 152 exhibits to hung on the wall. Granolithographs, lithographs, mixed media on tinted paper. Some of them was professional painters and practice painting all of his life, others make some special work for charity purposes. By their original works, all these movie stars brings to her countless fans another of her remarkable talents - that of artist and designer. Total of 61 original works of 29 world known movie superstars. Exhibition is unique and bears in itself an element of show. She does not have analogue in the world! - Will be hung on the wall : 29 panels + 45 exhibits + 1 big inside banner for entrance 3.2m x 3.0m. - 16 works for exhibit in display cases. Total minimum length of wall needed : 80,30 m.
The exhibition is composed by exhibits from Private Collection of Litographies of Magritte of his illustrations for "Les Chants de Maldoror". The exhibition highlights the major key aspects of work of the greatest artist of our time - René Magritte. Rene Magritte was one of the most well known and famous surrealist painters of all time, yet it was not until his 50s, when he was finally able to reach some form of fame and recognition for his work. He was extremely influential in the transformation of surrealism art, to the pop art movement, with the work he created, and the distinct style which he took with the creations that he made during the course of his career. Much of the work created by Rene Magritte, takes everyday, normal objects, and he would simply rearrange the figures, and locations, forcing the viewer to take a deeper look at what was in front of them, and at what the image truly represented. Total of 86 original works of René Magritte. Complete portfolios of original works of René Magritte for "Les Chants de Maldoror" of Isidor Ducasse and "Les nécessités de la vie et les conséquences des rêves" of Paul Eluard. Total of 36 original works of André Derain. Complete portfolio of original works of André Derain for "Satyricon" of Pétrone. The exhibition is composed by 49 original luxury Japanese woodblock prints - surimonos, of Katsushika Hokusai and his circle. Surimono are an exclusive subcategory of Japanese woodblock prints. Poetry clubs commissioned these designs for distribution to a small audience of members, most often as New Year's greetings. These privately published images included a wonderful range of subjects and lavish printing techniques such as embossing, burnishing, and metallic pigments. Since surimono were not sold commercially, the print runs were very small and original Edo era surimono are incredibly rare in the market today. Leading artists such as Hokusai and other prestigious Japanese artists dedicated large portions of their work creating these refined and luxury Surimonos. Surimono prints was often commissioned by amateur literary groups and actors celebrating specific roles in the Kabuki theater... Surimono print is a marvelous world of beauty and luxury. Because privately commissioned, cost was no object and this shows in the wealth of techniques and materials that the artist, wood carvers and printers used to produce the Surimono prints. Total of 49 original surimonos of Katsushika Hokusai and his circle. Original surimonos of : Katsushika Hokusai, Totoya Hokkei, Ryûryûkyo Shinsai, Yashima Gakutei, Yanagawa Shigenobu, Matora Ōishi, Katsushika Hokuun, Kubo Shunman, Utagawa Toyohiro, Kitagawa Utamaro. • 49 big panels with HD macro photographies showing incredible multitude and richness of exclusive techniques applied in original japanese surimonos.